Update your everyday boot this spring with the insanely cool, cut-out moto boot. Boots aren’t just for winter anymore, these boots have a laid back, deconstructed look that is perfect for warmer weather! The cut-out moto boot is chic and sleek and adds edge to any outfit. For the bikier look, you can pair these boots with ripped boyfriend jeans, a t-shirt and a motorcycle jacket. For a grungy 90s vibe, pair these boots with a floral, flowy maxi dress; toughen up the look by tying a jean shirt around your waist (for our first trimester ladies out there). You can also go totally 90s with your boots by wearing them with a chunky sweater, oversized jean shorts, a fringe bag and colorful socks. 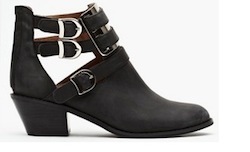 The distressed black leather, open sides, buckled straps and chunky stacked heel are great for everyday; they’re fashionable and comfortable all at the same time. The best part about these boots is that you can wear them all day and your feet won’t get hot. There is nothing better than having a shoe that completes your outfit, especially on the days when you just feel like wearing black on black or a t-shirt and jeans. 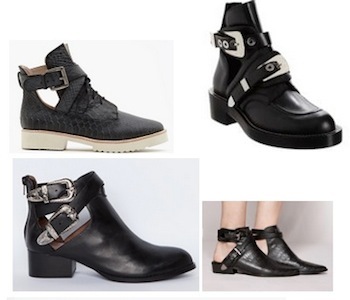 Upgrade your look with these boots, which can finish off your outfit and make it look more styled. I admit, like most girls I have a slight obsession with shoes. However, no shoe gets worn more than my everyday black boot. If I can’t figure out what to wear that day, I automatically go to my black boot and black jeans. With black jeans, boots and a great knit or button down, you are good to go. This look is a no-brainer. It can be so hard to get dressed during pregnancy and some days you just feel like a mess. I'm not saying that wearing a nice outfit is going to make the morning sickness go away, but it will help you feel a little better when you check yourself out in the mirror. So go rock your moto boots and feel like a rock star (motorcycle not included! ).